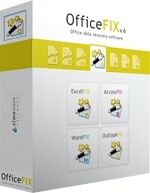 OfficeFIX bundles a set of tools intended for repairing corrupted Office documents and retrieving their content. The suite includes dedicated applications for recovering Word documents, Excel spreadsheets, Outlook mail files and Access databases. Cimaware Software is a privately held firm based in Madrid, Spain that develops data recovery utilities for businesses and individuals. 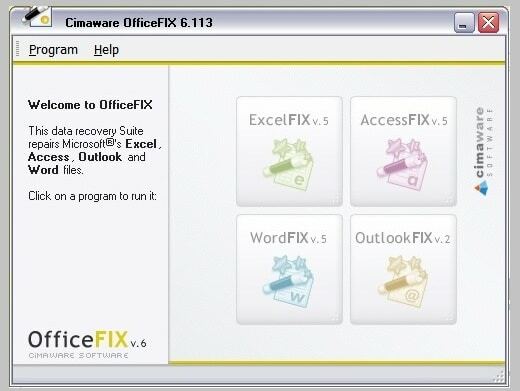 Since the release of the OfficeFIX product line in 1999, Cimaware Software has become a leading provider of Microsoft® Office file recovery utilities and has sold its software to some of the largest businesses in the world. AccessFIX — is the best option for Microsoft® Access database recovery and undelete. Restores all the important elements in the file accurately. ExcelFIX — is the best solution for repairing corrupt Microsoft® Excel files and restoring the data. It is the only one that recovers all important details such as graphs and images. WordFIX — is the best Microsoft® Word document recovery program. All the data is restored in seconds. OutlookFIX — is the best Microsoft® Outlook PST file recovery and undelete program. It is the only one that recovers all the elements and important details.